It wasn’t so obvious at the time, but Harry Kane had the chance to square the ball to Raheem Sterling and make it 2-0 in the first half of tonight’s World Cup semi-final defeat. The Tottenham striker was put through on goal and decided to shoot instead, but pictures now show how he had a man completely open just next to him. As the tweet below says, this picture will haunt English fans for a long, long time, with the team well on top for so much of that first half. Kieran Trippier’s superb free-kick had given Gareth Southgate’s side a 1-0 lead after just five minutes, but goals from Ivan Perisic and Mario Mandzukic ended up turning things around and send Croatia through to the World Cup final with France. 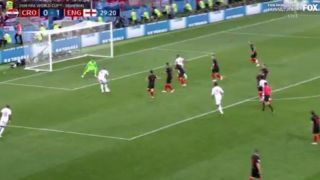 If this had gone in, however, one imagines there would have been no chance of Croatia coming back, with England so dominant and confident, with a second goal likely to have only opened things up even more. Sadly it wasn’t to be, and Kane had a poor game overall this evening, though it’s worth keeping things in perspective and remembering how much this side has surprised us all in Russia this summer.